Almost everyone wants to travel more, but where to go and when? It’s such a pervasive question that the Smithsonian Institute wanted to get the bottom of it with a lecture, presented by none other than HoneyTrek! To prepare for our two-hour presentation, on 2018’s Must-See Destinations & Travel Hacks, we cross-referenced the 500+ places we’ve visited against industry trends, world news, and our inner circle of globetrotters. We organized the talk by month to help people explore at the ideal times for the best weather, cultural offerings, lowest prices, fewest tourists, and most incredible experiences. 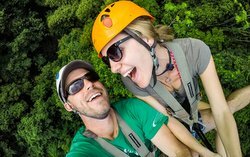 It was $45 a head to attend the lecture, but because we love you guys and genuinely want to help people make travel a bigger part of their lives, we’re creating this post with our picks for 2018’s best destinations by month, and our top tips and hacks to make those ambitious travels a reality. Immersive Local Experiences: We’re thrilled to see the AARP’s finding that more and more travelers of all ages like the idea of touring with a local–49% in 2018 compared to 40% in 2017. After all, it’s the people that make each place so special! Middle East: According to a recent World Tourism Organization Travel Barometer, the Middle East is the fastest-growing travel destination in the world. Having spent a month there last spring, we can see why. See our December pick. Tracing Your Roots: With companies like 23andMe making it easier than ever to test your DNA, more people are interested in identifying their roots and exploring the places they came from. Whether you run a saliva sample or not, looking to your family tree can provide great itinerary inspiration. Solo Travel: Google searches for “solo travel” and “travel alone” hit an all-time high in January of 2018. Travel companies are now building catered products to not only accommodate but to celebrate the solo traveler. Intrepid Group (a global leader in sustainable group trips) has seen a 40% increase in solo passengers, so in 2018 they (among other big dogs) launched their first solo-only tours. Cold Weather Love: Winter travel is becoming less about escaping the cold, and more about finding the beauty in it. A recent study found that 53% of Americans would not be seeking a warmer weather for their vacations this winter. Warning, three icy destinations ahead. Multi-Stop Trips: Google Trends reported a 32% increase in searches for multi-city and multi-country flights. Part of this is because Americans are taking fewer vacations (according to the Allianz Travel Insurance Vacation Confidence Index 42% of Americans did not use all their allotted vacation time last year.) so when people actually do take a vacation, they want to see and do more. Before we give our picks for best destinations by month, we can’t ignore how many travel industry nods were given to Korea for the Olympics, the Czech Republic for celebrating three upcoming anniversaries, and the Caribbean who needs all the support it can get after a horrible hurricane year! We’ve chosen the best of the “trend lists,” plus the under-the-radar places we’re most passionate about. With a Delaware-sized slab of the Larsen C Ice Shelf tumbling into the Weddell Sea last July, the Antarctic peninsula became extra epic for iceberg spotting. Sailing and kayaking between massive bergs is like entering a megalithic sculpture exhibit, and one of the experiences that truly moved us in Antarctica (in addition to the curious penguins nibbling on our shoes and killer whales migrating alongside our expedition ship). This monumental calving is a reminder of the urgency to see and, most importantly, protect the fragile white continent. Shared by 53 countries for scientific advancement and the common good of humanity, Antarctica is as close to utopia it gets. Mother Nature runs this show, and with the ocean, wind, and wild animals on her side, she’s crafted one of the most stunning places on Earth. Why now: January is the height of Antarctic summer with an average temp of 35F and good odds for sunshine. Every month of expedition season is a wildlife special, though January is among its most endearing with 100s of thousands of baby penguins waddling their first steps. Alternate Months: November-March. Early in the season allows for snow sports and late February brings the whales. HoneyTrek Tip: Don’t pay full price. Sign up for the (Quark, Aurora & OneOcean) expedition newsletters to track flash sales or head south to find last-minute deals in person in Ushuaia, Argentina. 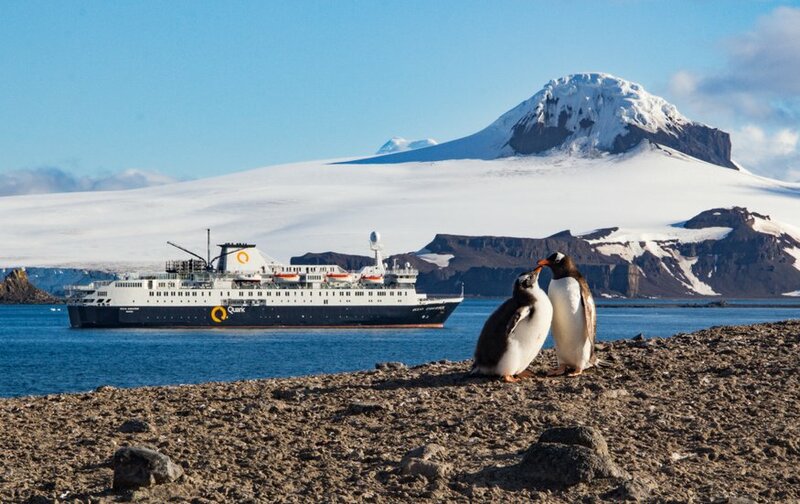 HoneyTrek Trips also gets some pretty sweet deals from our partners, so if Antarctica is on your bucket-list, shoot us an email and we will let you know when the crazy deals hit and you can take it from there. New Zealand is on nearly everyone’s bucket list, but in a rush to get to Queenstown and Milford Sound, most people overlook this region at the northern end of the South Island. Not only is it the sunniest spot on the isle, the region is one of NZ’s most culturally rich with colonial architecture, art galleries, boutiques, wineries, and festivals throughout the year. Plus, it’s home to the gorgeous Abel Tasman National Park. Turquoise seas against golden sand beaches, granite headlands, and lush forests offer incredible opportunities for inspiration and adventure. Its stunning 37-mile coastal trail has been deemed one of the nine Great Walks of New Zealand, and where you can also ferry and kayak between trailheads. Venture outside the bounds of the park and you’ll find some of New Zealand’s finest vineyards, biggest sand dunes, and most artistic Kiwis. Why Now: February is the tail end of summer in New Zealand which means the outdoor concerts and festivals are still in full swing and the waters are warm enough to maximize enjoyment on the coast. Alternate Months: It’s pleasant year-round; winter temps are only in the 50s with calm seas, abundant marine life, and even fewer people. HoneyTrek Tip: Download the Project Janszoon app for Abel Tasman National Park’s maps, history, tides, flora, and fauna. It’s like having a visitor center in your pocket. The dual-nation falls are the largest in North America and among the most visited in the world, but few people make it there in winter. Of all the globe’s greatest falls (Iguazú, Angel, Victoria, etc. ), this is the only one that freezes. See the cascades framed with a glacial layer of ice, its boulders entombed in frozen mist, and its trees dripping with icicles. The Niagara region is also emerging as an impressive food and wine destination with over 100 wineries and the Culinary Institute that’s popping out top-notch chefs and restaurants. Why Now: 2018 has been unseasonably cold which means this year is yielding a proper ice spectacular and by early March, the weather should be warm enough to enjoy your time outdoors. Alternate Months: If temperatures heat up anytime in January or February, beeline for the border. HoneyTrek Tip: No one gets a great view of the falls without touristy trappings. Stay up the gorge in charming historic towns like Lewiston, NY or Canada’s Niagara on the Lake. The Amazon Rain Forest should be on everyone’s bucket list but when the basin spreads 2.9 million square miles across eight countries, it’s hard to know where to begin. We say, head to Yasuní. Where the Amazon meets the Andes, the cool waters flow from the mountains, and the equatorial sun shines bright, Yasuní National Park emerges as one of the most biodiverse places on the planet. In a single hectare, the park is home to more than 100,000 species of insects (that’s more than all of North America combined). And in less than 0.2% of the Amazon’s total landmass, you can find over 33% of its bird and reptile species. Cruise down the Napo River, and you’ll be dazzled by swinging monkeys, diving pink dolphins, sleeping sloths, feasting parrots, and wildlife at every turn. Why Now: Yasuní needs our help. In recent years drilling for crude oil has come dangerously close to the national park. The more visitors they get, the more reasons Ecuador has to protect this precious environment. Alternate Months: Being along the equator, the weather doesn’t fluctuate much so come anytime, just bring a raincoat. HoneyTrek Tip: Wild Yasuní doesn’t have much infrastructure for independent exploration. The accessible regions and activities are largely determined by your outfitter. Pick one that maximizes your time and budget. Everyone’s heard of Punta Cana…but Barahona and Pedernales? You’d think this area of the Dominican Republic would be famous for having the country’s only UNESCO Biosphere Reserve, the lowest point in the Caribbean, and the one place in the world to find the precious larimar stones, but no… the Southwest DR is a hidden gem. We spent a week exploring the region and were in awe of its dramatic landscapes, biodiversity, convivial spirit, and that we virtually had the place to ourselves. Stroll untouched beaches, horseback ride lush jungles, climb pine-covered mountains, island hop through a wildlife reserve, and truly get away from it all! Why Now: This is the country’s next big thing (trust us, we know people at the tourism board). 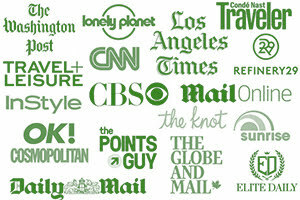 Go while there isn’t a single hotel chain or big box anything. Alternate Months: February, March, April, and November. HoneyTrek Tip: Before you road-trip the Southwest, spend a couple days in Santo Domingo: The oldest city in the Americas. Time your flight to Santo Domingo so you catch Monasterio de San Francisco’s Sunday concert series. A full stage is set up at the foot of the atmospheric 16th-century ruins, and all the locals come out to shake a tail feather. Our Southwest DR Experience: Read about it in our feature for Travelocity. In this southwestern province, 80% of the landscape is covered with dramatic karst mountains. It’s also home to our two favorite towns in China: Fenghuang and Wulingyuan. Remember those floating mountains in the movie Avatar, dripping with greenery and swarming with dragonlike creatures? See Wulingyuan’s 3,000+ quartzite sandstone towers in a sea of fog and you’ll see where director James Cameron got his inspiration. Just 150 miles south, you’ll reach the 1,200-year-old city of Fenghuang. An emerald green river runs through a town connected by Ming-dynasty bridges and narrow flagstone streets. By night, the swallow-tail roofs are illuminated and the water reflects ancient architecture in a rainbow of colors. Chinese are the only tourists you’ll find here, and you’ve never seen a group of people so happy to be in their own backyard. Why Now: May & June is the sweet spot for weather between the two regions. While Wulingyuan just made Lonely Planet’s 2018 Best in Travel List, Fenghuang will be our little secret. Alternate months: March, April, September, and October. HoneyTrek Tip: You need a visa for China and getting one remotely can be complicated. Fly into Hong Kong, and process your visa in person at The Commissioner’s Office of China’s Foreign Ministry while you enjoy the city for a couple days. From HK, you can hop a ferry to Shenzen, where you get cheaper flights or take the train into Hunan. A stunning island in the Nusa Tenggara archipelago, Flores is the kind of magic you hope for in travel— where motorbiking through a lush mountain pass brings you to a timeless village, chatting with locals leads to dinner in a thatch-roof home, listening to music sparks up a traditional dance lesson, and laughing breaks down any language barriers. The isle sits in the heart of the Coral Triangle, a region with 76% of all known coral species in just 1.6% of the world’s oceanic area. Scuba diving Komodo National Park is bucket-list worthy, plus it’s the only place the world’s largest lizards roam. Continue inland and you’ll find idyllic tribal villages, color-changing crater lakes, and some of the friendliest people we encountered in our travels. Why Now: It’s been said that Flores is what Bali was in the 70s. It’s an authentic corner of the world that’s quickly gaining popularity; go sooner than later. Alternate months: April-July make for lush mountains and calm seas with high visibility, though most of the island is lovely through September. HoneyTrek Tip: Take buses between Labuan Bajo and Bajawa and Moni (a truly cultural experience, often involving goats on the roof), then rent a motorbike to explore the surrounding villages and gorgeous countryside. The Maasai Mara is incredible for safari…and everyone knows it. Head five hours north of Nairobi and you’ll find rare wildlife and barely any tourists. Tucked into the Great Rift Valley, the area has remained largely untouched by tourism or development, allowing the nomadic cultures of the Borana, Samburu, Meru, and Turkana people to carry on their traditions and Africa’s endangered wildlife to thrive. Grevy zebra, Masai lions, and reticulated giraffes can be seen here against a landscape of cinematic beauty. Ever see Out of Africa or Born Free? These films were shot along Samburu’s golden grasses, winding rivers, and ancient volcanoes. A safari here is something that will woo even the most seasoned of game drivers. Why Now: The winter month of August brings thinner vegetation and a higher concentration of animals at the watering holes for more abundant sightings. It’s also when the wildebeest migration happens down south. Alternate Timing: June-October also brings the benefits of winter safari. HoneyTrek Tip: Enjoy more incredible game drives in nearby Meru national park and hike around Mount Kenya, the country’s highest peak. Continue south for the Maasai Mara’s wildebeest migration to complete the ultimate safari trip. For each chapter of Ultimate Journeys for Two, we selected a world-traveling couple to pick their absolute favorite destination. When we asked Lisa & Alex of 2People1Life, who road-tripped more than 150,000 miles across 70 countries…they chose Georgia and we’ve been dreaming about it ever since! The crossroads of Europe and Asia and once a part of the Soviet Union, it’s a fascinating blend of cultures. As for the landscape, it’s sandwiched between the Black Sea and the 18,000-foot Caucasus Mountains, with the world’s oldest wine country (in fall 2017 archaeologists unearthed the earliest evidence of winemaking here). The capital of Tbilisi got a nod from both Condé Nast Traveler and National Geographic Travel’s Best of 2018 lists. The ancient city is having a cultural revival with luxury hotels and gourmet restaurants popping up, without losing Georgia’s world-famous hospitality. Why Now: September will offer lovely weather with minimal crowds. Alternate months: Summer is the best time to enjoy mountainous Georgia’s great outdoors and even July and August won’t have that many tourists. Georgia Guide: You’ll just have to see what we said in Ultimate Journeys for Two. Often overshadowed by the ever-popular Caribbean and Pacific beaches, Mexico’s heartland is perhaps our favorite region of the country. You’ve heard of the expat haven of San Miguel de Allende but its neighbor Guanajuato is the rising star. A narrow valley lined with colorful houses, connected by winding stairwells, tunnels, and alleyways, Guanajuato is a maze of treasures. Rounding a bend can lead to a bandstand of traditional musicans, Diego Rivera’s childhood home, or the best enchilada of your life. From the 16th-19th centuries (when Guanajuato’s mines accounted for two-thirds of the world’s silver production), the Spanish colonialists spared no expense. Opulent churches, ornate theaters, and metropolis-like mines have collectively put the city on the UNESCO map, while the University of Guanajuato and October’s Cervantino Arts Festival keep it young and lively. Why Now: For three weeks every October, Latin America’s biggest celebration of the arts, The Cervantino Festival takes over Guanajuato. Music, dance, and theater groups from around the world perform diverse works across the city’s 49 theaters, parks, street corners, and alleyways. Alternate Months: It never gets too cold or rainy, come when suits you. HoneyTrek Tip: Mexico City was announced as the 2018 World Design Capital. Fly into MEX, stay for a few days enjoying the various festivities, then road-trip to Guanajuato, stopping at the ancient city of Teotihuacan, and San Miguel de Allende along the way. We have driven this route, and thousands of miles around Mexico, and never felt unsafe. Everyone wants to see the Northern Lights…but peak season is the coldest, darkest time of year. Come to Norway’s side of the Arctic Circle in early November and you’ll hit the sweet spot for dancing auroras, daylight until mid-afternoon, and the warmth of the gulf stream that inland Scandinavia and Canada never get. Norway has 15,000 miles of coastline and 1,100 fjords, plus medieval towns, charming fishing villages…these are not things to be seen in the dark! Start in Tromsø, The Gateway to the Arctic and capital of Northern Norwegian culture. Then hop on the Hurtigruten, the national-ferry-meets-cruise-line—to sail deeper into the Arctic Circle for ample opportunities to spy northern lights and stops at fjord towns only accessible by boat. Why Now: October through early November is also the only time catch the fall foliage with your fjords and northern lights. Alternate months: March gets similar weather and daylight, while die-hard aurora chasers will appreciate January’s dark skies. HoneyTrek Tip: Hurtigruten is having its 125th anniversary and offering discounts on many of their cruises to celebrate. With over 30 ports and daily departures, they make it easy to customize your route based on your timing and interests. If can take a longer vacation, begin in the charming medieval city of Bergen and make it to the Russian border of Kirkenes. Call us up if you want to chat about planning this journey (877) 727-TRAVEL. Home to a 7th New Wonder of the World, a desert made famous by Lawrence of Arabia and The Martian, the Red Sea and Dead Sea…Jordan’s got plenty on offer. We were here in spring 2017 and can say Jordan is even better in person than on paper. Plus, there is a new way to enjoy the country’s epic landscapes, ancient trade routes and paths believed to be walked by Jesus, Moses, and Muhammad. The Jordan Trail traverses the nation through the Rift Valley, Petra, Wadi Rum, and down to the biodiverse Red Sea, with nothing short of spectacular scenery and profound history along the way. Why Now: No matter how many miles you chip off the Jordan Trail, Jordan’s improved infrastructure is making it easier to find adventure. Jordan often gets lumped in with the Middle East’s bad press but it’s one of the most stable and inviting countries in the region. Alternate Months: If you like your desert a bit warmer, try March or April. HoneyTrek Tip: Get the Jordan Pass for your visa and discounts on major cultural attractions rolled into one. Use community-based tour operator A Piece of Jordan for your exploration of the Petra surrounds and unforgettable local immersion. Repeat after us, “I hereby solemnly swear to take all my vacation days in 2018.” Pledging to uphold such an easy and fabulous promise may seem a little ridiculous…but, as you know, the stats say otherwise. To beat the excuses to the punch, here are few ways to make travel a little easier this year. Start a Travel Fund. Direct deposit 5% of your paycheck each month into a separate bank account, made exclusively for adventures. Get Annual Travel Insurance. When you have automatic coverage on every trip you take this year, bumps in the road won’t slow you down and you’ll have the peace of mind to fly by the seat of your pants. For as little as $125, Allianz annual plan is a great choice (note: We have been using the Allianz annual plan for years and recently became ambassadors for them). Start Collecting Frequent Flyer Miles. Having a treasure trove of miles will make pulling the trigger on your next trip that much easier. Interested in learning how we’ve taken 122 free flights on this trip? Here’s how. 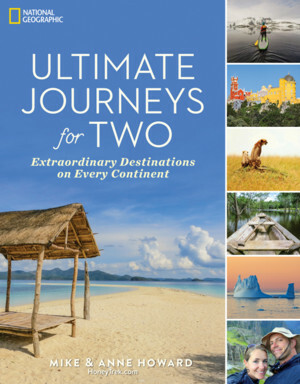 Read Ultimate Journeys for Two, all the above destinations are featured in greater detail in the book, plus 63 more of our favorites and an entire chapter on making travel more affordable, accessible, and an integral part of your life. Reach out to HoneTrek Trips. We want to help mobilize your next journey with our off-the-track travel agency. Email [email protected]; we look forward to hearing from you! Check out our Smithsonian Resources. To see our full presentation of 2018’s best destinations by month and tons more travel hacks, check out our full resource page from our Smithsonian lecture. Just remember, when work and life get in the way, travel is an investment in yourself. Don’t skimp! That is interesting how travel destination choices have reversed. Trying to find beauty in winter destinations is hot and happening! Solo traveling is picking up for sure. I have not been to any of the destinations you mentioned… little disappointing for me. My reason to travel to Niagara falls in winters would be one to see them frozen and second to avoid those crowds that it attracts. I wonder why there is no destination from India on this list. We probably need to work on marketing our destinations better. Travel companies do need to start catering to solo travellers – right now they are too focussed on group trips. Dominican Republic seems to be the place to hit up at the moment in this part of the world but for me, it has to be China. I love China and has so much to offer. Where are you based, Danik? The DR is an easy hop from mainland North America so it can be done in week trip. China is amazing when you have a few weeks to dig in…it’s huge and packed with history! What a great post. I haven’t heard of Guanajuato, Looks like I need to do some research on the area. Petra in December sounds perfect!!! Sherianne, Guanajuato is so dreamy, as is Jordan! Hope you make it to both! Always love when we get the roundtheworldDeb seal of approval 🙂 like the sound of a Georgia road trip…summer 2019? Hi Mike & Anne, I just finished reading your beautifully written article and what stunning photos! Thanks for sharing a lot of destinations I’ve never even heard of. So glad you enjoyed the blog! Let us know where it takes you this year! Great post guys…so many exciting places to visit on this list…now I need to pad my savings account even more!